The concept of time is a crucial filter through which we understand any events or phenomena; nothing exists outside of time. It conditions not only the question of ‘when’, but also influences the ‘what, how and why’of our ideas about management. And yet management scholars have rarely considered this ‘temporal lens’ in understanding how time affects employees at work, or the organizations for which they work. This 2-volume set provides a fresh, temporal perspective on some of the most important and thriving areas in management research today. Volume 1 considers how time impacts the individual, and includes chapters on identity, emotion, motivation, stress and creativity. Volume 2 considers time in context with the organization, exploring a temporal understanding of leadership, HRM, entrepreneurship, teams and cross-cultural issues. There is an overall concern with the practical implications of understanding individuals and organizations within the most relevant timeframes, while the two volumes provide an actionable research agenda for the future. This is a highly significant contribution to management theory and research, and will be important reading for all students and researchers of Organizational Behavior, Organizational Psychology, Occupational Psychology, Business and Management and HRM. 1. 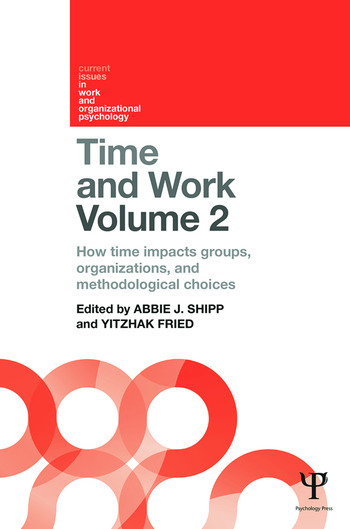 Yitzhak Fried and Abbie J. Shipp, Time Research in Management: How Time Impacts Groups, Organizations, and Methodological Choices. 2. John E. Mathieu, Michael R. Kukenberger, and Lauren D'Innocenzo, Time and Teams. 3. David V. Day, Time and Leadership. 4. C. Ashley Fulmer, Brandon Crosby, and Michele J. Gelfand, Cross-Cultural Perspectives and Time. 5. Robert E. Ployhart and Donald Hale, Jr., Human Resource Management is Out of Time. 6. Brett Anitra Gilbert, Conceptualizing Time in Entrepreneurship. 7. Scott F. Turner, The Temporal Dimension of Routines and their Outcomes: Exploring the Role of Time in the Capabilities and Practice Perspectives. 8. David Chan, Time and Methodological Choices. Abbie J. Shipp is Assistant Professor of Management at Texas Christian University, USA. Her research focuses on the psychological experience of time at work including: the trajectory of work experiences over time, how time is spent on work tasks and how individuals think about the past/present/future. Yitzhak Fried is Professor of Organizational Behavior and Human Resources at Syracuse University, USA. His research focus is on the contribution of context in the areas of job and office design, work stress, time in the workplace, performance appraisal, diversity at work and cross-culture. He is a Fellow in the American Psychological Association, Society of Industrial and Organizational Psychology and Society of Organizational Behavior.